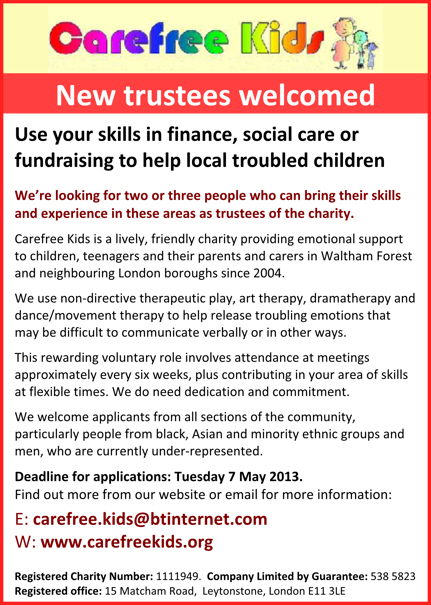 We’re looking for two or three people who can bring their skills and experience in these areas as trustees of the charity. 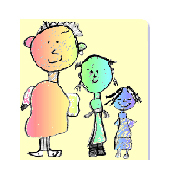 Carefree Kids is a lively, friendly charity providing emotional support to children, teenagers and their parents and carers in Waltham Forest and neighbouring London boroughs since 2004. This rewarding voluntary role involves attendance at meetings approximately every six weeks, plus contributing in your area of skills at flexible times. We do need dedication and commitment. We welcome applicants from all sections of the community, particularly people from black, Asian and minority ethnic groups and men, who are currently under-represented. Deadline for applications: Tuesday 7 May 2013.